NEWARK, N.J. (AP) — Kyle Palmieri scored at 2:37 of overtime, and the Anaheim Ducks extended their winning streak to seven with a 3-2 victory over the New Jersey Devils on Friday night. Palmieri, from nearby Montvale, N.J., swung around Devils defenseman Eric Gelinas and circled behind the New Jersey goal. He then tucked a wraparound behind goaltender Cory Schneider. Mathieu Perreault and Cam Fowler also scored for the Pacific Division-leading Ducks, who matched the franchise record with their second seven-game winning streak this season. Jonas Hiller made 19 saves in the win. Andy Greene and Michael Ryder had the Devils goals. 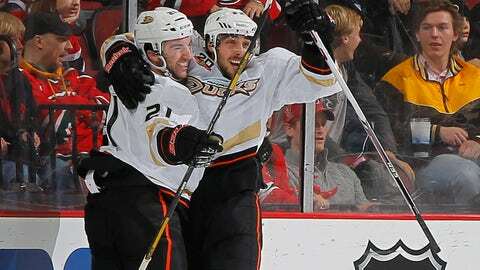 Perreault, who assisted on Palmieri’s score, gave the Ducks a 2-1 lead at 10:47 of the third. He converted a centering feed from Palmieri that bounced off Gelinas’ skate and landed on his stick in the slot for his sixth goal. New Jersey tied it again with 5:02 to go in regulation. Greene’s power-play goal was set up by Jaromir Jagr, who hit the defenseman in the left circle with a backhand pass. Ryder and Fowler scored in the second period. Ryder put New Jersey in front with his 10th goal at 4:15. He got a backhand pass from Adam Henrique and lifted a shot over Hiller’s left shoulder. Fowler made it 1-1 at 14:06 with a blast from the left point, using Palmieri as a screen against Schneider. NOTES: This was the second contest of a four-game road trip for the Ducks. … Anaheim had time to adjust to the Prudential Center. The Ducks practiced here on Wednesday and Thursday. … Ryan Getzlaf was in the lineup for Anaheim. He left the previous game against Detroit in the first period with a facial injury. … The Devils concluded a three-game homestand. They play in Washington on Saturday night. … Devils RW Steve Bernier played in his 500th game; Hiller made his 300th appearance. … Devils RW Damien Brunner was helped off the ice late in the first period following a knee-on-knee hit along the boards by Ducks D Mark Fistric. He did not return.